Many homeowners who discover a problem with their foundation underestimate the seriousness of the issue. Foundation problems, however, are a major concern that should be repaired as soon as possible. A problem such as a sinking or settling foundation causes other areas throughout various areas of your home. Fortunately, Atlas Piers can provide you with expert services to take care of all of your foundation repair needs. One of the most common issues that occurs with a home is a settling foundation. If you notice bowing or leaning walls, cracks in the walls or floor, uneven or sloped floors, sticking doors, or sticking windows, you could have a settling or sinking foundation. To repair a settling foundation, Atlas Piers uses steel push piers or helical piers. 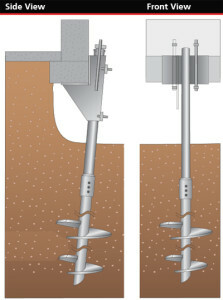 Push piers are driven into stable soil deep under the surface of the ground. Then, the weight of the structure is transferred onto them and the foundation is raised back to its original position. Helical piers work in much the same way, except instead of being merely driven into the ground, they are screwed in to provide a little extra stability. Pressure grouting is another solution for sinking foundations. In this process, a grout is injected under the foundation to fill and stabilize voids that may have been causing the foundation to shift or settle. Another one of the foundation repair products commonly used is a helical tieback, or wall anchor. These anchors are used to counter the external pressure that sometimes causes foundation walls to lean or bow inward. They are long steel poles with multiple “screws” on them that are screwed into the ground adjacent to the affected basement walls to help support the walls and keep them upright.